The CDC is currently under construction in Dunsinane estate, Nuwara Eliya. One of the key objectives of the project is to improve community infrastructure facilities in remote villages based on priorities identified by the communities themselves. The project is currently implementing 18 infrastructure initiatives identified at Community Action Planning (CAP) Workshops held in the project locations. In one of the selected locations – Dunsinane estate, a Child Development Centre is currently under construction with funding from the project. Dunsinane estate, one of the largest estates in Nuwara Eliya district, was established in 1879. Managed by Aitken Spence Plantations, the estate has a land extent of 790 Hectares, of which 518 ha has been cultivated with tea and 100 ha with Eucalyptus. The Indian Housing Project is providing funding to construct permanent houses for 404 families in this estate. UN-Habitat, as the implementing agency is constructing the houses in two locations – Factory division and Middle division. At factory site, 158 permanent houses are under construction. According to Government regulations, a preschool or Child Development Centre should be located within a two km radius of any village or settlement. At present, the nearest Child Development Centre (CDC) for factory division is located four kilometres away from the village. Therefore, when UN-Habitat commenced the HDI project in the area, the community identified a CDC as their main priority for the new settlement. The CDC is a valuable asset for plantation communities as it doubles up as a crèche. Women who work in the estate leave their children at the CDC in the morning, until they return from work every evening. “Shramadana” activity by community members to clear and level the construction site. UN-Habitat to implement the construction of the Child Development Centre in June 2017. Funding of LKR. 12.8 Mn is being provided by the HDI project through UN-Habitat for this initiative. 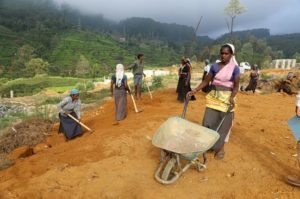 The community is providing a financial contribution of LKR.40,000 as well as their in-kind labour contributions towards the project activities. The Child Development Centre is expected to directly benefit 73 children from 55 families. The Dunsinane community has actively participated in the construction of the CDC. Prior to starting construction, the land was cleared, levelled and landscaped through a “Shramadana” activity with community participation. Commencing construction in July 2017, the building is currently at lintel level. Once completed, the CDC will be 1,954 square feet in extent consisting of a preschool, kitchen, infant room, play area, office room, medical room and toilets for the children, teachers and caregivers. The project will also provide furniture such as desks and chairs for the CDC. The building is designed in a child-friendly manner with the children’s health, safety, well-being and development in mind. It has a number of play areas for the children including a “Role Play Area”; a “Small World Play Area” as well as a “Creative Area”– where the children can draw and paint. An Outdoor Play area, which is partially covered, will give the children an opportunity to play outdoors every day. The building is constructed following National Building Research Organisation (NBRO) guidelines, enabling its use as a temporary emergency shelter during a disaster situation. In addition, the building will provide office space for Government officers including the village midwife. 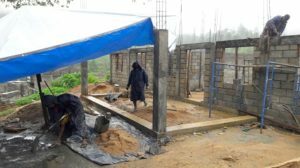 The CDC is being constructed with fair face blocks for walls, Aluminium roofing sheets and wooden door and window frames. Disaster Risk Reduction features such as raised foundations, external columns, plinth beams, continuous lintel, roof beam and column, roof anchoring are being incorporated in the construction. “This child development centre was specially requested by the community members. 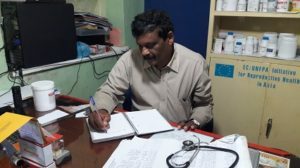 Dr. Rajenthiran, Estate Medical Officer, Dunsinane Estate & Secretary, Dunsinane EWHCS. UN-Habitat is providing training for the communities and local construction workers on eco-friendly and cost-effective construction methods and materials. Direct and indirect employment opportunities are also being created in the area through the construction activities. It is expected that the technical and management capacity of the EWHCS will improve significantly by implementing this project.